Purdue researchers say a single photon emission enhancement could be a step towards quantum technologies; in planning algorithms developed by MIT researchers, the probability of success can be evaluated and low-risk alternatives suggested. Purdue University researchers have demonstrated a new way to enhance the emission of single photons by using “hyperbolic metamaterials,” in a step they say could be used in developing quantum computers and communications technologies. Optical metamaterials harness clouds of electrons called surface plasmons to manipulate and control light. The team previously created “superlattices” from layers of the metal titanium nitride and the dielectric, or insulator, aluminum scandium nitride. Unlike some of the plasmonic components under development, which rely on the use of noble metals such as gold and silver, the new metamaterial is compatible with the complementary metal–oxide–semiconductor manufacturing process used to construct integrated circuits. They explained that the metamaterial is said to be hyperbolic, meaning it possesses unique properties leading to the increased output of light. Now, they’ve demonstrated how attaching nanodiamonds containing “nitrogen-vacancy centers” to the new metamaterial further enhances the production of single photons, workhorses of quantum information processing, which could bring superior computers, cryptography and communications technologies. 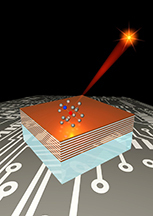 They say the results indicate that the brightness of the nanodiamond-based single-photon emitter could be substantially enhanced by placing such an emitter on the surface of the hyperbolic metamaterial and that the single-photon emitters could be used to build highly efficient room temperature CMOS-compatible single-photon sources. Researchers in MIT’s Computer Science and Artificial Intelligence Laboratory have created planning algorithms that can evaluate the success of something and offer low-risk alternatives. The same underlying framework has led to software that both NASA and the Woods Hole Oceanographic Institution have used to plan missions, MIT said. While a better Siri would be nice, the algorithms could be just as useful for any planning task — say, scheduling flights or bus routes. One aspect of the software that distinguishes it from previous planning systems is that it assesses risk and is always hard working directly with probabilities, because they always add complexity to computations, the researchers explained. As such, they added the idea of risk allocation, and say, What’s your budget of risk for this entire mission? Let’s divide that up and use it as a resource. Interestingly, both procedures are rooted in graph theory. In this context, a graph is a data representation that consists of nodes, usually depicted as circles, and edges, usually depicted as line segments connecting the nodes. Any scheduling problem can be represented as a graph. Nodes represent events, and the edges indicate the sequence in which events must occur. Each edge also has an associated weight, indicating the cost of progressing from one event to the next — the time it takes a bus to travel between stops, for instance. In essence, the algorithm first represents a problem as a graph, then begins adding edges that represent the constraints imposed by the planner. If the problem is soluble, the weights of the edges representing constraints will everywhere be greater than the weights representing the costs of transitions between events. Existing algorithms, however, can quickly home in on loops in the graph where the weights are imbalanced. The MIT researchers’ system then calculates the lowest-cost way of rebalancing the loop, which it presents to the planner as a modification of the problem’s initial constraints.